The Occupational Safety and Health Administration (OSHA) has very specific training requirements for individuals who operate forklifts, which are referred to as powered industrial trucks. According to OSHA regulations, employees who have not been properly trained to do so are not allowed to operate forklifts. The initial component of any forklift safety training certificate program must include training about both workplace and vehicle-specific safety. It's important for those learning to drive forklifts to realize that there are many important differences between these types of vehicles and cars or trucks. Early forklift training includes instruction regarding the unique nature of visibility and stability in forklift operation. Trainees learn how to properly operate forklifts, and are educated about the dangers and safety precautions that must be observed at all times. The formal part of forklift training also includes information about using the vehicle's controls and instrumentation, as well as specifics about how to steer and maneuver the unit. Those training to operate forklifts at work also receive training related to the inspection and maintenance duties operators are required to carry out. For example, training includes instruction on how to attach and adapt forks to the unit and how to refuel or recharge batteries. In addition to learning specifics about operating a forklift, it's necessary for operators to learn practical considerations about operating a forklift in the workplace. They must learn how surface conditions, aisle width, and hazardous locations can impact vehicle operation. It's also important for trainees to learn how to manipulate various types of loads and to stack and un-stack their cargo safely. In addition to completing formal instruction regarding the proper forklift operating procedures, workers must also participate in practical, hands-on training. 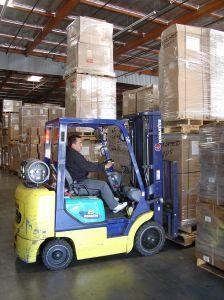 Additionally, trainees must demonstrate the ability to successfully operate a forklift. A qualified individual must evaluate their performance in a realistic situation, so there is no question regarding whether or not the individuals has the skills necessary to operate the forklift safely. Earning a forklift safety training certificate one time does not give an individual a green light to continue operating a forklift throughout his or her career without completing continuing education. OSHA requires that forklift operators undergo re-evaluation at least every third year. There are a number of situations in which forklift operators are required to complete refresher training more frequently than every three years. If an employee is involved in a forklift accident or experiences a near miss, the worker must complete refresher training and he or she will have to undergo another performance evaluation. Additionally, any worker who does not pass his or her performance evaluation will have to repeat training before being allowed t return to operating a forklift. Many community colleges and trade schools offer forklift safety training programs that provide hands-on instruction and evaluation. You can also take online courses related to forklift safety, many of which lead to certificates. If you're thinking about enrolling in a class, be sure to select an OSHA compliant training program so you can be certain that the certificate you are working towards will actually fulfill the workplace training requirements. Employers often implement their own forklift safety training program. If you'd like to implement a forklift program at your company, see OSHA's Training and Reference Materials Library for details about what is required and to download materials and checklists that can be used in your on-site training efforts. You can also purchase training materials, including forklift safety videos and training manuals, from a variety of training and consulting firms.